﻿ Xcel Heat Bank Systems from Thermal Integration Ltd.
twenty years of continuous development and improvement of thermal store technology. using any, or all types of heat source. 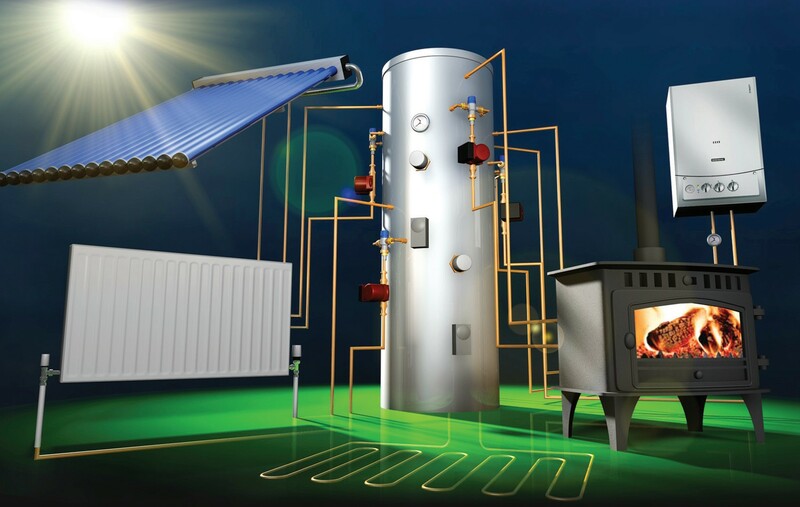 Suitable for simultaneous connection to Wood Burners, Stoves and Biomass Boilers, Gas and Oil Boilers, Solar Panels, Heat Pumps, Vented and Sealed Heating Systems including Radiators and Underfloor Heating, as well as High Performance Showers and Multiple Bathrooms. Very high quality Stainless Steel Laser Welded Construction. Performance guaranteed. The Xcel stores the heat and uses it to provide enough hot water to run all hot taps at the same time, as well as central heating. In doing so it makes it possible to run domestic properties from a zero-carbon approach, with backup options tied in. Currently the most popular combination to achieve zero carbon is a wood burner as the primary heat source, driving central heating and hot water in winter, with solar thermal panels for hot water in summer. This combination has the added temptation of free hot water and heating. 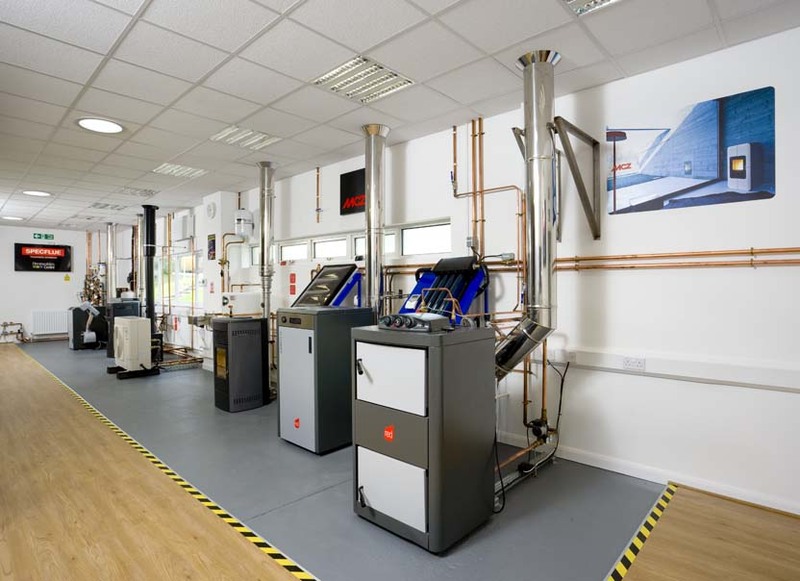 A gas boiler has been the traditional backup, but this is changing towards wood chip, pellet or log boilers, and heat pumps, driven recently by the new feed in tariffs, that pay you money for doing so. main attraction, the Zero Carbon House. possible from solar thermal and biomass and hence payback. the renewable technologies we have sourced." The core of the Xcel system is a very high quality stainless steel storage cylinder. This is insulated and cased in a coated steel casing. The unit provides 28 separate connections in various sizes, making any combination of heat sources and loads possible. And keeping your options open for the future. The finished Xcel is supplied to you as a fully fabricated system, as shown here. all the components needed to make everything work in perfect harmony are factory fitted, wired and tested. This approach has the added benefits of reduced installation times, 25 years design experience, and additional on-site backup. Designing a system from scratch can be a difficult process, even for an experienced designer. To overcome this we have spent the last ten years developing online software to take you through a design, ask all the important questions, do the maths, and design your system for you. The first stage of the Online System Designer involves a series of questions relating to your property and what you wish to do. 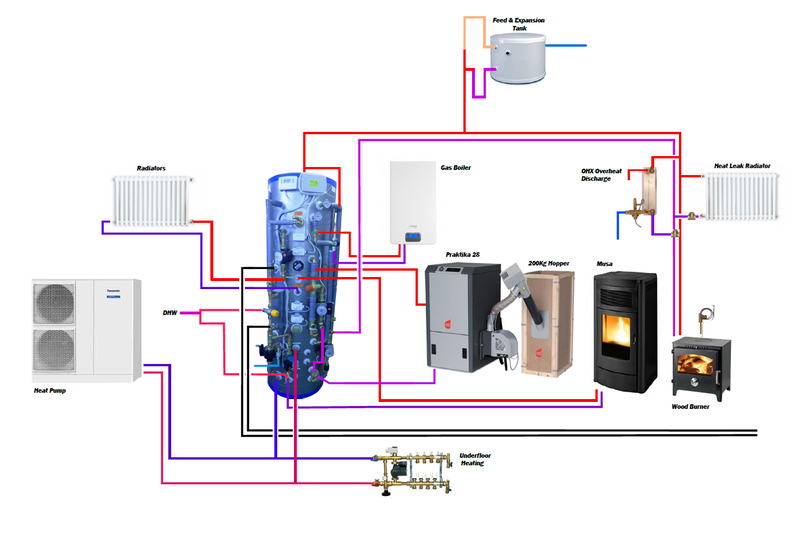 It asks you about hot water requirements, central heating, the types of heat source you wish to employ, and any other questions that are needed to ensure a system is designed properly, without forgetting anything important. As the Designer collects information it generates a calculations page from your answers. This checks that the system will 'work' and prompt you to make changes if there seems to be a problem. It also works out energy used on an annual basis, as well as carbon footprints, running costs, and potential feed in tariffs. Once we have the outline or a working design, the Designer generates a list of equipment and options that is required to do what you have asked. Pricing information is provided to give you a feel for the costs of the system. and help you calculate pay-back times. A schematic drawing is then generated, providing detailed information on how the system connects together, and allowing you to visualise the whole system in operation. This can be used to discuss the technical side of the installation with our technical consultants, or with your installers. A photograph of the finished and assembled Xcel system is generated so you can get a feel for the actual bit of kit you will receive. And finally, the system will generate a list of trustworthy and experienced installers in your area. These installers have been hand picked by us over the years, and they have all shown themselves to be technically competent, honest, and value for money. That's why it is recommended by most wood burner manufacturers. Why do they all recommend us ? 25 years experience, and the best design service available. 1. Xcel uses a Plate Heat Exchanger for Hot Water rather than a Coil. This gives a huge performance benefit to the Xcel. The following graph shows the output of a Heat Bank compared to a a well known make of coil type thermal store. The graph details the temperature of water provided over time, with taps running at 18 litres per minute (a good bath tap). The graph demonstrated two key differences between plate heat exchangers and coils. The first is how the output temperature from a coil type thermal store drops with time as the thermal store cools down. From the graph, within 5 minutes draw off the temperature of water produced becomes too cold to drive hot taps. Given that the draw off rate is 18 litres per minute, the coil delivers approximately 90 litres before performance drops off. By comparison, the Heat Bank draws water from the top of the store, returning it cold to the bottom, and hot water temperatures are maintained until nearly all the stored heat is used up. The result is 200 litres of hot water - over twice as much - from the same size 180 litre store. The performance of hot water coils is usually quoted for the initial draw off, when the store is at full temperature, and it is important to know that this is not the whole picture. The situation gets even worst when the store is only partially heated. For example, if only the top half of the store is heated, then with a coil type store only some of the coil is sitting is hot water and performance will be much lower than quoted. The Heat Bank however will give full performance with only the very top of the store heated, and as such allows it to operate in an economy mode with only smaller volumes heated up. This is very noticeable when starting a system from cold. The Heat Bank will generate hot water to taps in only a few minutes from cold start, where a coil type store will take some time while the majority of the store is heated up. Coils also have another disadvantage - they scale up. We pioneered coil type thermal stores some 30 years ago, and have a great deal of experience with them. One thing we found was that in hard water areas the coils scaled up rapidly, becoming unusable within a year in some instances. This is a result of the fact that the coil is sitting in hot water and the mains water inside the coil heats up to store temperatures. At these temperature limescale rapidly deposits and if not serviced in time will result in the coil becoming unusable and the cylinder may need changing (there are a few sites where coil type stores have failed this way and the entire site has had units changes to Heat Banks). On a Heat Bank the heat exchanger sits externally to the store and is not submerged in hot water. It is still possible for a plate heat exchanger to scale up, but it is far more gradual and easy to service. There have only ever been a handful of instances where plate heat exchangers have been left to the point where limescale became a real issue. Most were solved with a powerflush, and in the couple of occasions where this did not work the heat exchanger was replaced. Another advantage of plate heat exchangers over coils is the power of them to generate hot water. The standard heat exchanger on the Xcel is capable of generating over 100kW of mains hot water, or over 40 litres per minute, and at pressures up to 10 bar. In order to get anywhere near the performance of a plate heat exchanger, a coil size needs to be so large that the cylinder itself usually needs reinforcing to carry the weight of the coil. There are also options for over 300kW plate heat exchangers, achieving levels of performance beyond the reach of any coil. Plate heat exchangers can produce approximately twice as much hot water from the same size store fitted with a hot water coil. Plate heat exchangers function to full performance with only small volumes of the store heated, allowing the use of an economy mode, and providing hot water within minutes of a cold startup. Coil type stores suffer badly from limescale depositing within the coil. 2. Patented Top-Down Reheating of Stored Water. When using a boiler to reheat stored water, Xcel Heat Banks offer advantages that NO other thermal store provides. 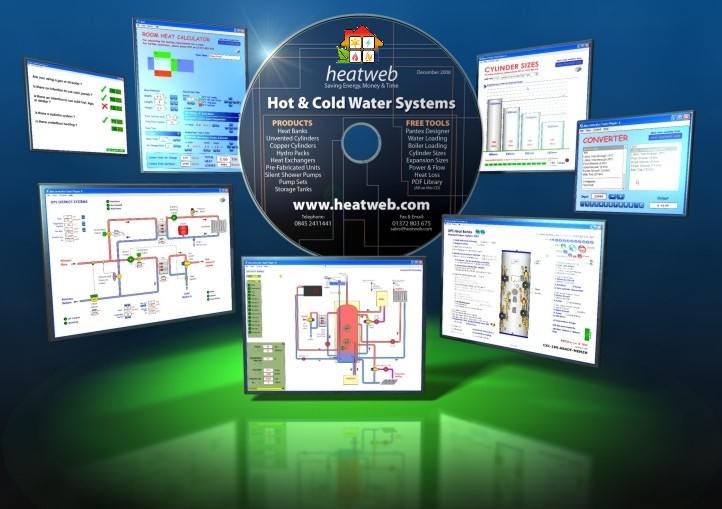 We spend a number of years perfecting our patented top-down reheat system that uses a return temperature control to ensure that the water fed to the boiler for heating is always at the perfect temperature to ensure optimum efficiency, and in turn guarantee that the water fed into the top of the Heat Bank is at a temperature that can be used immediately. Other makes of thermal store use a simple flow and return pipework to boiler, where water is pumped from the bottom of the thermal store to the boiler and back. The problem with this system is that the temperature of water in the bottom of the thermal store varies greatly, from 25°C up to 70°C, and a boiler will only lift water temperature 20°C in a single pass, typically 15°C. If the water in the store is at 55°C, then the boiler will heat it to 70°C - fine. The problems start happening when the bottom of the store drops to say 35°C. At this point the boiler will heat the water up to 50°C, and this is too cold for achieve decent performance. This 50°C water is fed back into the thermal store, and can adversely affect the performance of hot water outlets currently running, as upper store temperature start dropping. To look at the problem with other stores from another angle, look at a thermal store as it is heated from cold (25°). On the first pass the boiler raises the store temperature from 25 to 40°C. It has to heat up the whole store so this takes some time (15 minutes for a 300 litre store running of a 20kW boiler). The boiler then has to heat the store from 40 to 55°C, and again this takes another 15 minutes. Once the store is at 55°C it should be possible to achieve low flow rates to taps, although to achieve stated performance you still need to wait even longer as the boiler heats the store from 55 to 70°C. With the Xcel, as soon as the system is started water is recirculated around the boiler until it reaches 70°C. This usually takes less than a minute, and then the system feeds the 70°C into the very top of the Heat Bank where it can be used immediately for hot water. Most customers have great pleasure in pointing out how they manage to obtain showers within minutes of starting the system up - a big difference from their previous systems where they had to wait over half an hour for any hot water. The benefits of this type of reheating are multiple. If, for example, the aim of reheating is to run a shower or wash up some dishes, then there is no need to reheat anything more than the very top of the thermal store. As just described, when using other thermal stores one will need to heat up the entire store just to obtain a few litres of hot water. This is very inefficient, especially where there are renewable heat sources such as solar in the picture. The Xcel top-down reheating allows the user to only heat up the water they need, and no more. This saves time and money, and also ensures that there is enough cold water in the store for the solar panels or wood burner to work with. These benefits make it possible to fit quite a large store into a property to allow for a 'full house' without loosing efficiency when there is only one or two people living there. The amount of water heated can be adjusted to match the occupancy level of the property, and this is a benefit unique to the Xcel Heat Bank. Rapid reheating using the full output of the boiler. The ability to easily set how much stored water is heated, and how much water is left unheated for use with renewables such as solar. Lower standing heat losses as minimal volumes of water are heated. 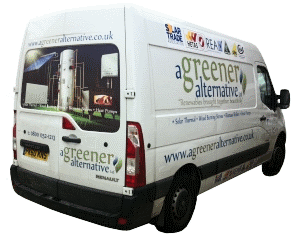 Maintains condensing mode on condensing boilers, while stopping boiler rot in oil and pellet boilers. Maintains temperature differential across boiler. 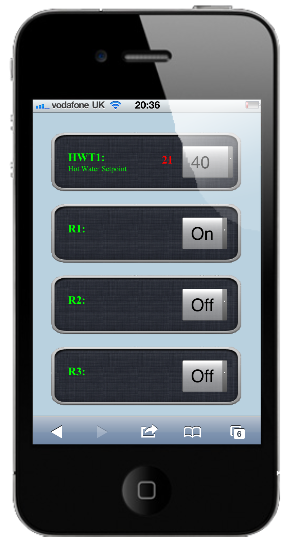 Automated control of economy/full store modes using programmer and two or more cylinder thermostats. 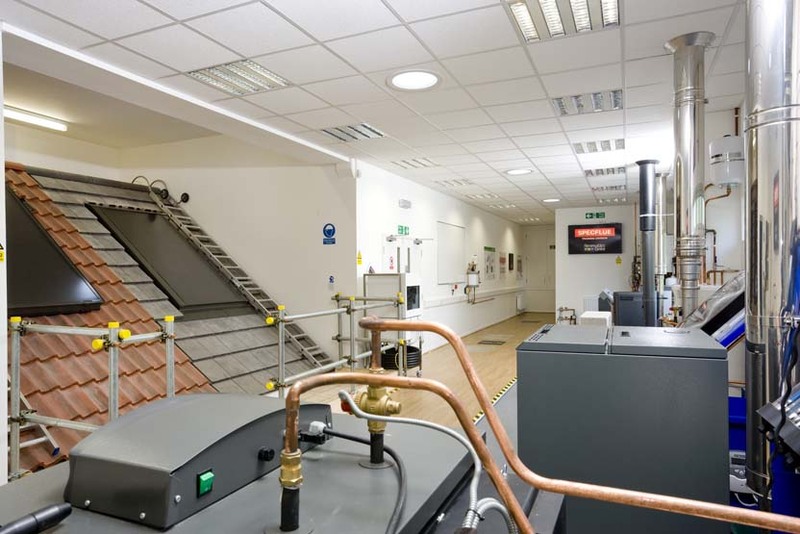 Another unique aspect of the Xcel Heat Bank (again, patented by us so unavailable anywhere else) is its ability to protect from overheating, even during a power cut. This system was designed primarily for systems connected to a wood burner. It is needed because wood burners provide a large amount of energy, and they don't turn off, even when there is a power cut. As such they easily have the ability to boil the water in a thermal store if there is no other form of protection. The wood burner is thermostatic, and slows its burn rate down when it gets hot. The heat leak radiator is large enough to dump the output of the wood burner. A location can be found above the wood burner for a dedicated heat leak radiator. The problems start occurring when not all of these criteria can be met, and given that most wood burners are not thermostatic and have an output of approx 9kW to water, the chances of dedicating 9kW of radiators (three large double convectors) to this function becomes impossible. The protection system on the Xcel works on the basis that the heat can circulate from the wood burner to the Heat Bank naturally using thermo-syphon (gravity) circulation. The Xcel is fitted with a heat exchanger in the top, and if the temperature of the water in the store ever goes over 95°C then a mechanical valve opens up to allow cold mains water to pass through the heat exchanger and out to drain, cooling down the stored water as it does so. The heat exchanger can extract over 12kW of heat and as such is suitable for all types of wood burner, and in many instances is the only way that the latest building regulations (now covering vented systems) can me met when using a wood burner. When someone is designing a system for you to run with a wood burner, ask them to guarantee that the system will not boil if there is a power cut and the wood burner is kept going at full output. Some installers may state that it is ok to get away with a fairly small heat leak radiators, but they are often not taking into account changes in building regulations that now cover vented systems. There is a reason why the Xcel Heat Bank is the only system that all well known wood burner manufacturers approve is that we know how to ensure systems are safe. Again this is a patented system we have developed ourselves and is available no where else. It is also worth pointing out that there are two other forms of overheat protection built into Xcel Heat Bank systems. The first is an overheat thermostat that turns on the central heating when the store reaches 90°C. This protection is the normal day-to-day protection and requires power supplies to be on, and pumps to be functional. The other form of protection is the system is open vented. Whatever happens and if ever the system does boil, you have peace of mind that the vent pipe will protect the system from catastrophic failure. Protects against system boiling even during a power cut. Often the only way to comply to latest building regulations. Approved by most wood burner manufacturers. When we designed the Xcel, the whole intention was to come up with a Heat Bank design that was suitable for 95% of the enquiries we received. Before the Xcel everything was custom made to order, and quite often customers would come back at a later date asking how they could retro-fit another heat source - a wood burner for example. The Xcel was given enough connection points to allow almost any combination of heat sources and loads to be connected, as well as a solar coil. It is not just enough to put on lots of connection points. They must be of the right size and in the right position, and thankfully our 25 years experience in designing multifuel thermal stores has allowed us to perfect the connection arrangement to make everything work as it should. For example, how many makes of thermal store provide two 1.1/2" connections for wood burners to ensure thermo-syphon works even on larger wood burner? It is safe to say that by fitting an Xcel Heat Bank you will never need to change the system ever again, whatever heat sources to wish to connect in future. We know from experience that having a future proofed Xcel system adds value to a property, although difficult to put a value on. In summary the Xcel Heat Bank can connect to all the following - at the same time ! When we say the Xcel Heat Bank should never need changing, whatever you decide to do in future, this is really only valid if the quality of the system is good enough to last a long time. The Xcel is manufactured for us from Duplex Stainless Steel, and connections are manufactured in-house without skimping on metal. The welding on the Xcel is performed in the same factory that manufactures nuclear waste containers for BNFL and as such the quality is second to none. One of the key differences between the Xcel Heat Bank and other thermal stores is the option to have the system supplied with all the heating and hot water controls factory fitted and wired. We have developed over 50 different assemblies to allow for all the different types and sizes of boilers out there, as well as the different types of central heating and hot water controls. These assemblies are selected during the design process, and are then fitted to the Xcel in such a way that saves a great deal of space and time during the final installation. We make sure pumps and valves are specified to the correct sizes to work with the selected equipment, and setup to work as intended. Standardised control assemblies also ensures that service engineers are faced with a known layout of components, with set documentation and spares. If an engineer needs to fault find a system years down the line, he can obtain the correct drawings and documents he needs, and can discuss the system over the phone with someone who is familiar with the relevant assemblies and controls. Where controls are put together on site, the only line of technical backup is usually from the installer that put the system together and know how it works. If he is unavailable then it can be very difficult for another engineer to get their head around the system in order to locate a problem. The specific design of each Xcel is stored on the internet for future reference. Any relevant documentation can also be uploaded to the web site, providing a very valuable resource for both householders and service engineers in years to come. It is worth noting that after manufacturing and providing on-site backup when things go wrong for many years, we know what components provide the best reliability. Xcel Heat Banks are always fitted with the best there is - not the cheapest. Xcel Heat Banks are supplied with a guarantee that the system will work as intended, along with one year of on-site backup to correct any issues. The only way this is possible is by taking customers through a rigorous design process that identifies potential problems prior to supply of any equipment, and ensures we have all the data we need to select the type of Xcel and assemblies with confidence. Our Online System Designer has been evolved over many years to help speed up this process, as well as provide the design tools necessary to take out the guess work. If there is ever a problem with an Xcel, we want to know about it, and we want to help fix it. This is a unique level of service not offered by other manufacturers, and one that keeps customers coming back as they know they are in safe hands. We do our utmost to ensure that installers have all the tools they need to perform succesful installations, conforming to the latest regulations. We never stand still. For the past 25 years we have been at the forefront of thermal storage design. Just type 'thermal store' into Google to see proof of this. At the moment we are working on the next generation of intelligent control systems that will allow customers to control their systems from their phone or computer. Systems will be able to send text messages if ever a fault occurs, and allow engineers to view graphs of the temperatures around the system along with the amounts of energy generated by the various heat sources and where this is used. We intend for this to tie into our online design system so that customers designing their own multifuel systems can look at real data from live systems already installed, and see how effective they are. Such advances in technology will always be made available for existing customers to retro-fit to their systems, should they wish to take advantage of them.